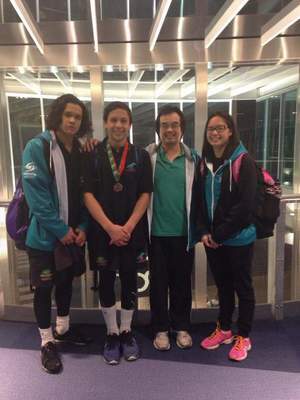 MAKING waves in the state ranks, the Oasis Otters Swimming Club members had a number of great swims at the Victorian Age Short Course Championships, held last week at the Melbourne Sports and Aquatic Centre. Showing the state that Dandenong-area swimming should not to be underestimated, Otters’ stars Hamed Afshin Azar, Hassan (Sam) Afshin Azar, Bridget Lin, Henry Kuok and Dheeraj Kulkarni surged to finish in the top ranks of Victorian junior swimming. Hamed Afshin Azar stormed home to pick up two medals at the event – a silver medal in the 200-metre butterfly and bronze medal in the 200-metre breaststroke as well as picking up finals qualifications for the 100-metre breaststroke (fourth), 200-metre individual medley (fifth) and 100-metre backstroke (fifth). Afshin Azar’s brother Sam had three finals finishes with a sixth in the 100-metre breaststroke, another sixth in the 200-metre breaststroke, a seventh in the 200-metre individual medley, and a seventh in the 100-metre butterfly. While Kuok gained a sixth in the 100-metre butterfly, Kulkarni a seventh in the 200-metre butterfly and Lin an eight in the 200-metre butterfly. All going to show the butterfly ranks at Oasis are on the rise. The club swims out of the Oasis Swimming Centre on Stud Road. For more information, contact the Otters via their website oasisotters.swimming.org.au or email oasisotters@gmail.com.